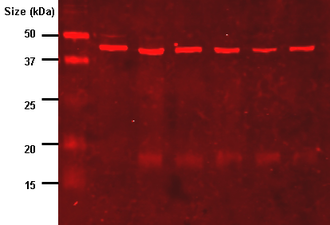 Western blot using an antibody that recognizes proteins modified with lipoic acid. The western blot (sometimes called the protein immunoblot) is a widely used analytical technique in molecular biology, immunogenetics and other molecular biology disciplines to detect specific proteins in a sample of tissue homogenate or extract. In brief, the sample undergoes protein denaturation, followed by gel electrophoresis. A synthetic or animal-derived antibody (known as the primary antibody) is created that recognises and binds to a specific target protein. The electrophoresis membrane is washed in a solution containing the primary antibody, before excess antibody is washed off. A secondary antibody is added which recognises and binds to the primary antibody. The secondary antibody is visualised through various methods such as staining, immunofluorescence, and radioactivity, allowing indirect detection of the specific target protein. 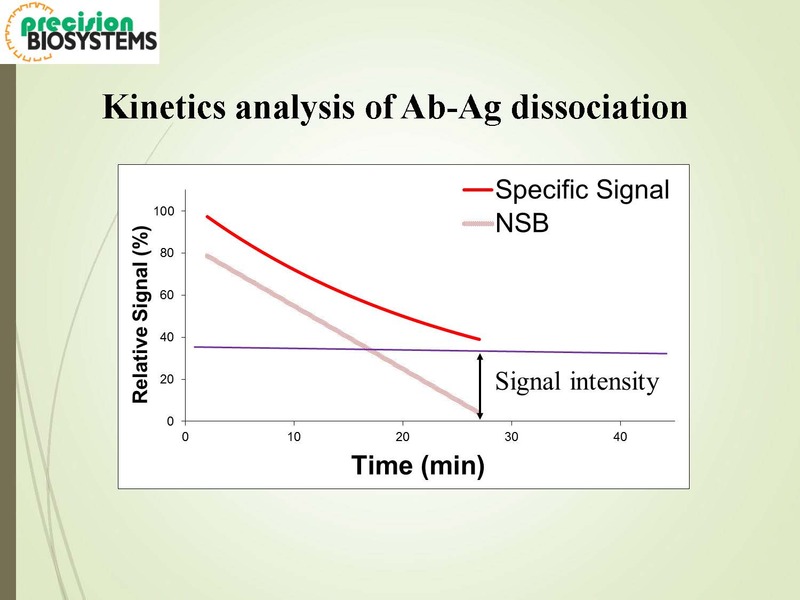 Other related techniques include dot blot analysis, quantitative dot blot, immunohistochemistry, and immunocytochemistry where antibodies are used to detect proteins in tissues and cells by immunostaining, and enzyme-linked immunosorbent assay (ELISA). 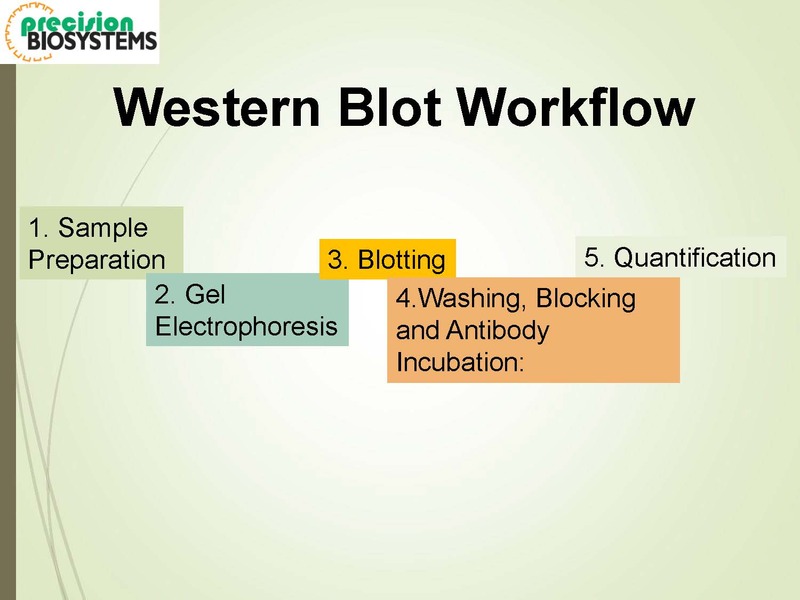 The name western blot is a play on the eponymously-named Southern blot, a technique for DNAdetection.Similarly, detection of RNA is termed northern blot. The term "western blot" was given by W. Neal Burnette, although the method itself originated in the laboratory of Harry Towbin at the Friedrich Miescher Institute. 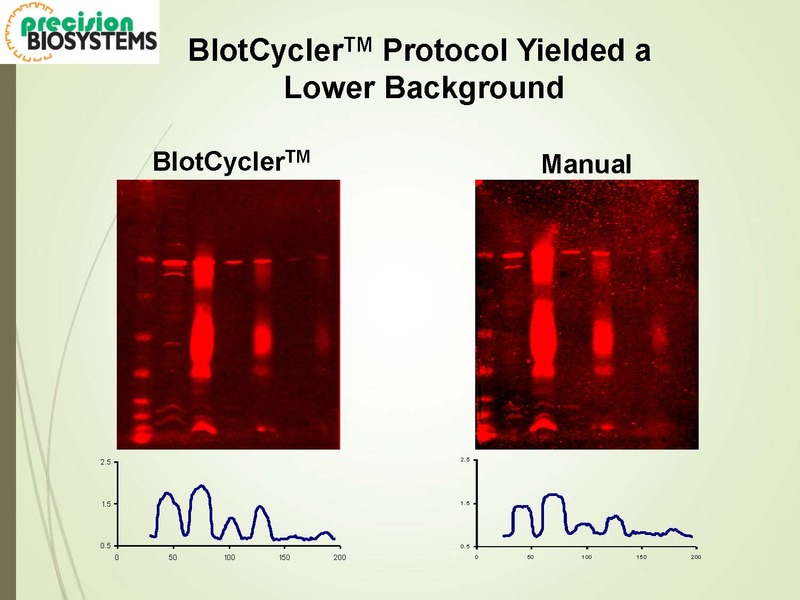 The western blot is extensively used in biochemistry for the qualitative detection of single proteins and protein-modifications (such as post-translational modifications). It is used as a general method to identify the presence of a specific single protein within a complex mixture of proteins. A semi-quantitative estimation of a protein can be derived from the size and color intensity of a protein band on the blot membrane. 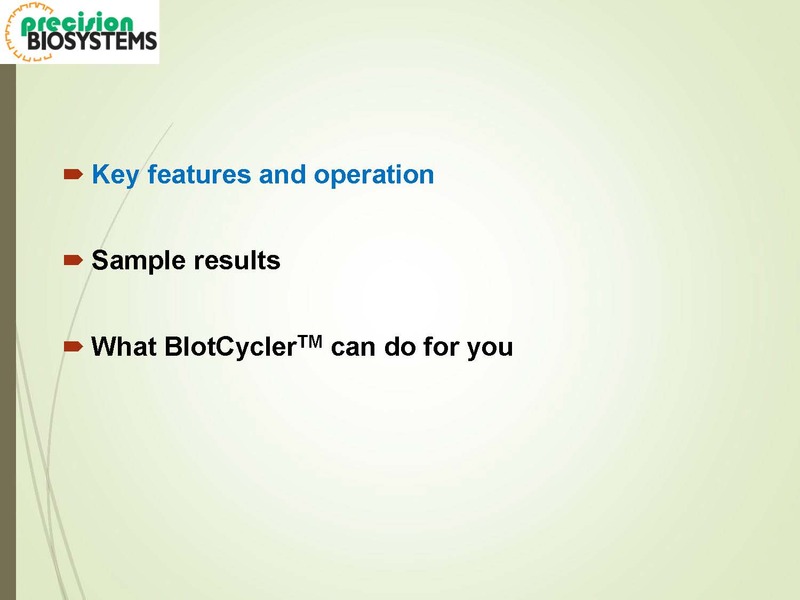 In addition, applying a dilution series of a purified protein of known concentrations can be used to allow a more precise estimate of protein concentration. 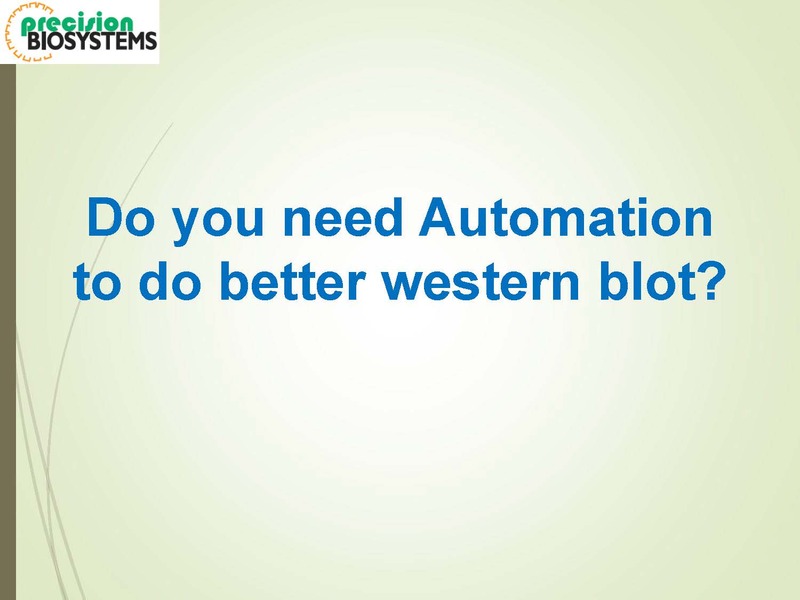 The western blot is routinely used for verification of protein production after cloning. It is also used in medical diagnostics, e. g. in the HIV test or BSE-Test. The confirmatory HIV test employs a western blot to detect anti-HIV antibody in a human serum sample. Proteins from known HIV-infected cells are separated and blotted on a membrane as above. Then, the serum to be tested is applied in the primary antibody incubation step; free antibody is washed away, and a secondary anti-human antibody linked to an enzyme signal is added. The stained bands then indicate the proteins to which the patient's serum contains antibody. Post-translational modification of insulin. At the top, the ribosome translates a mRNA sequence into a protein, insulin, and passes the protein through the endoplasmic reticulum, where it is cut, folded and held in shape by disulfide (-S-S-) bonds. Then the protein passes through the golgi apparatus, where it is packaged into a vesicle. In the vesicle, more parts are cut off, and it turns into mature insulin. A cow with BSE which has lost its ability to stand. 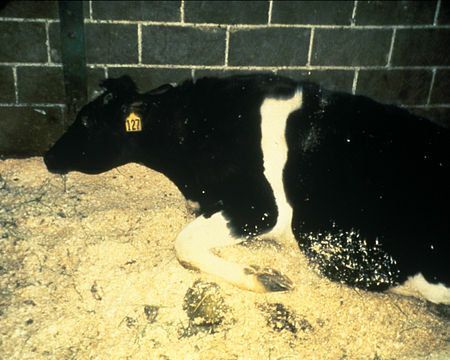 A western blot is also used as the definitive test for variant Creutzfeldt-Jakob Disease, a type of prion disease linked to the consumption of contaminated beef from cattle with Bovine spongiform encephalopathy (BSE, commonly referred to as 'mad cow disease'). Another application is in the diagnosis of tularemia. An evaluation of the western blot’s ability to detect antibodies against F. tularensis revealed that its sensitivity is almost 100% and the specificity is 99.6%. 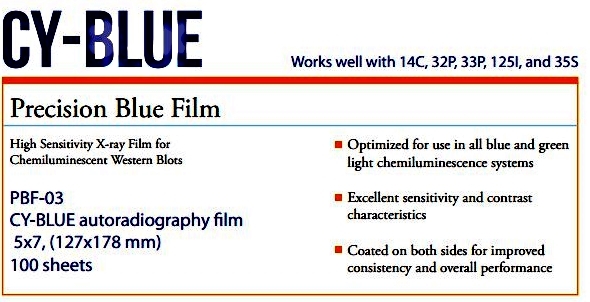 Some forms of Lyme disease testing employ western blotting. 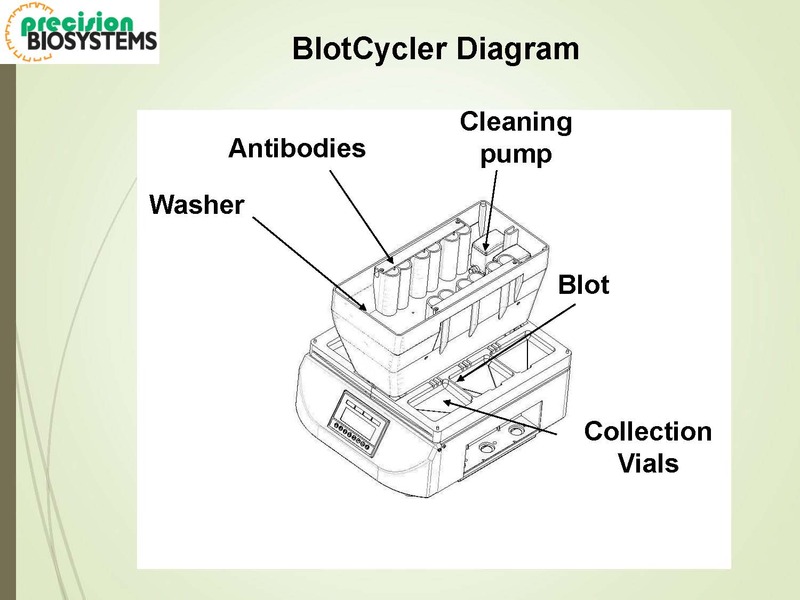 A western blot can also be used as a confirmatory test for Hepatitis B infection and HSV-2 (Herpes Type 2) infection. 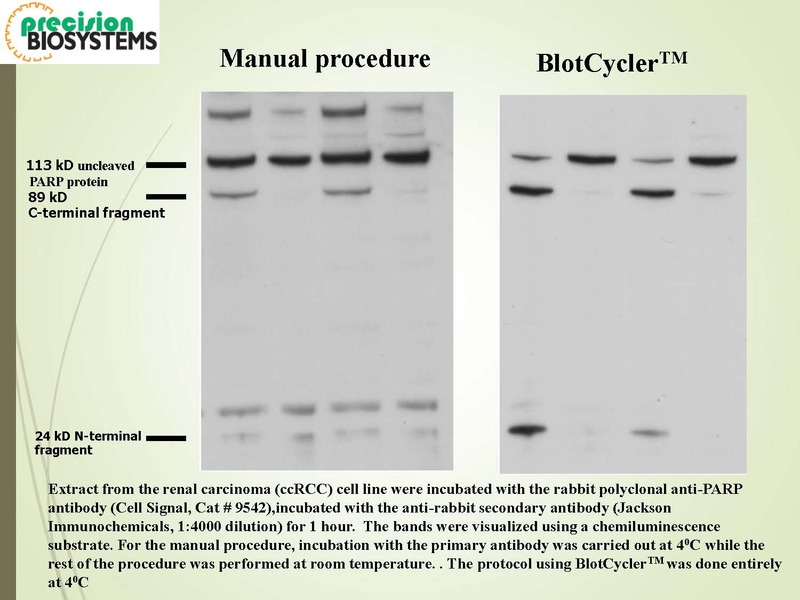 In veterinary medicine, a western blot is sometimes used to confirm FIV+ status in cats. 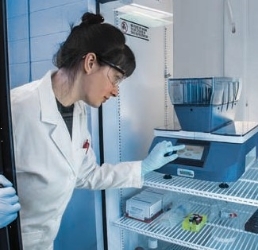 Our partners, the Precision Biosystems, is a leading professional instrument systems developer and manufacture for Western Blot Immunodetection Steps and Fluorescence DNA-CE with best Progammable Automation, Consistency, Reproducibility, Productivity, and Simplicity capabilities. 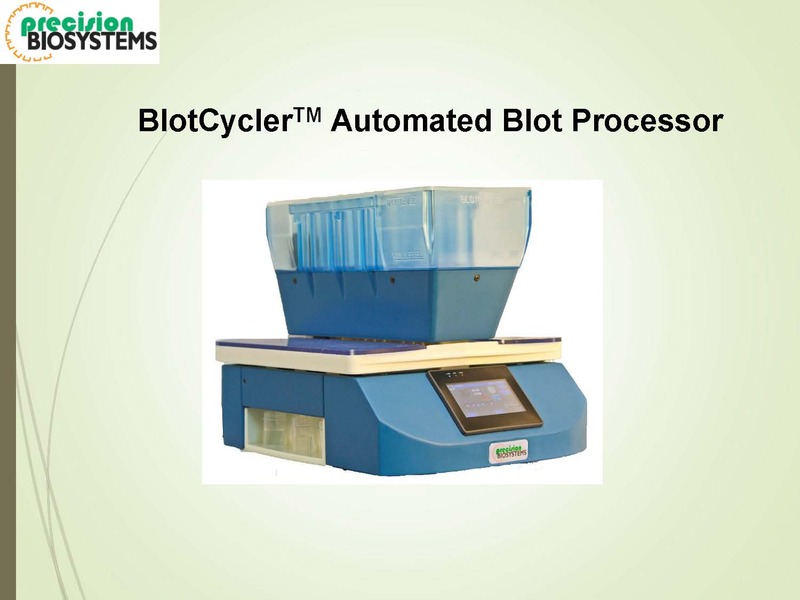 Precision Biosystems is a Massachusetts-based company that develops and manufactures BlotCycler™, an Automated Western Blot processing system. 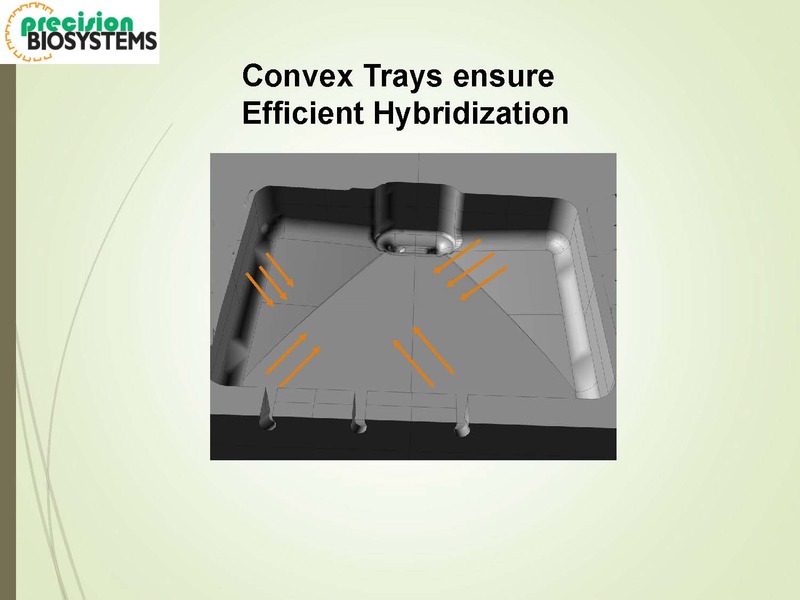 The system is based on patented fluid distribution technology. 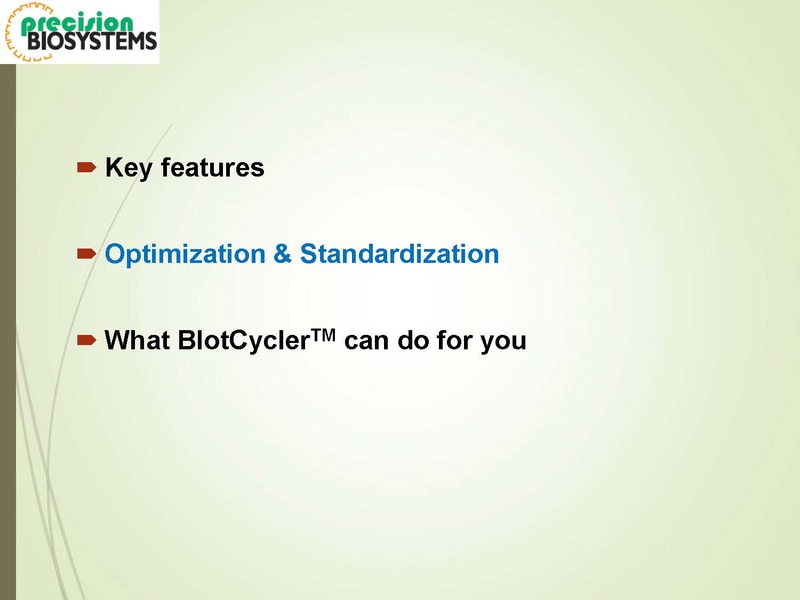 The overarching goal of BlotCycler is help you automate the traditional manual western blot processing during the immunodetection step. 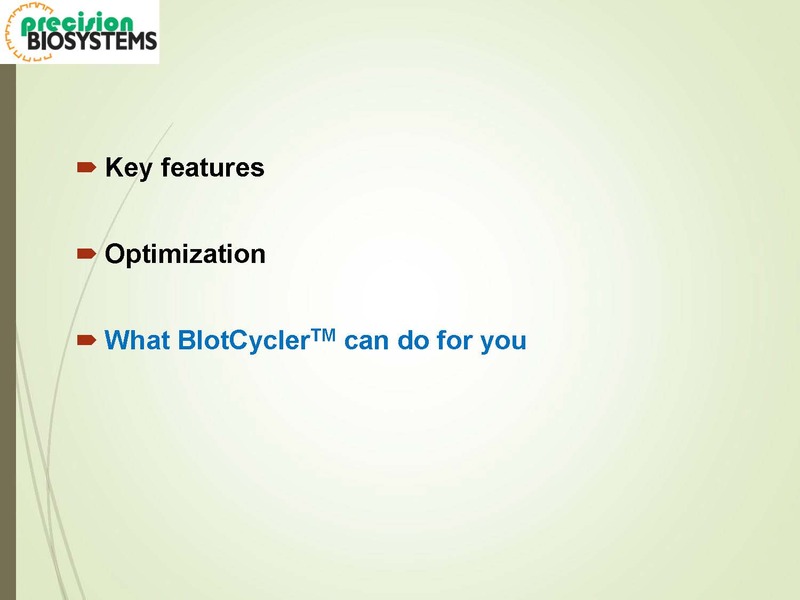 BlotCycler automates all steps after protein is transferred to a membrane. 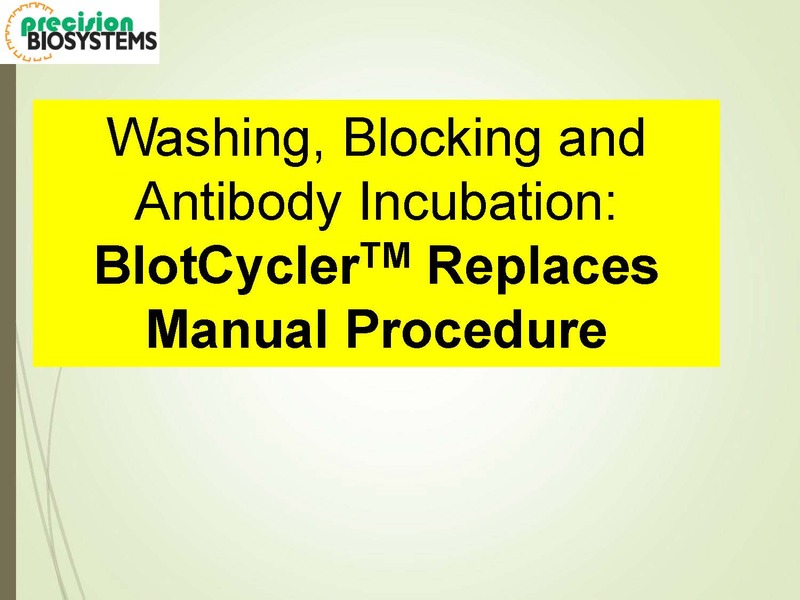 These include: shaking, blocking, hybridization, washing, and recycling of primary antibody. By eliminating the need for “babysitting”, BlotCycler offers you a unique advantage over existing immunoblotting technologies. 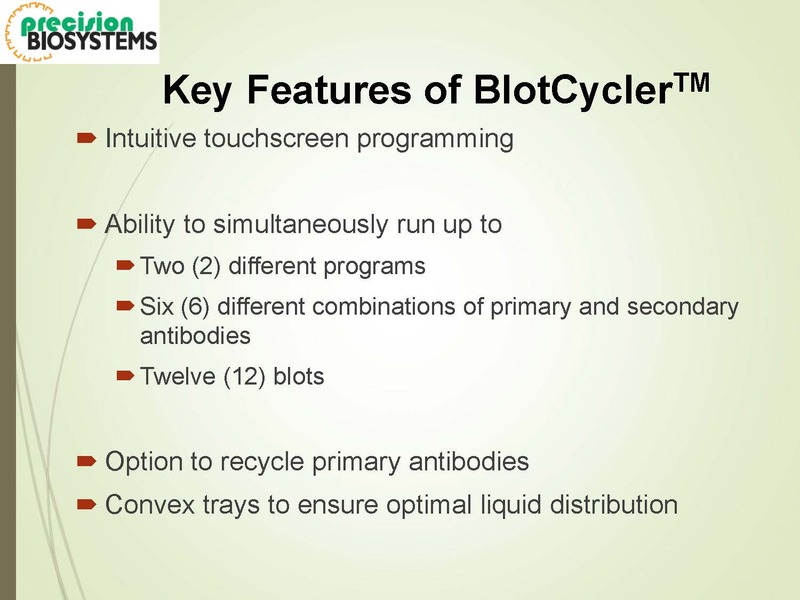 Furthermore, BlotCycler generates blots with higher signals and lower background. 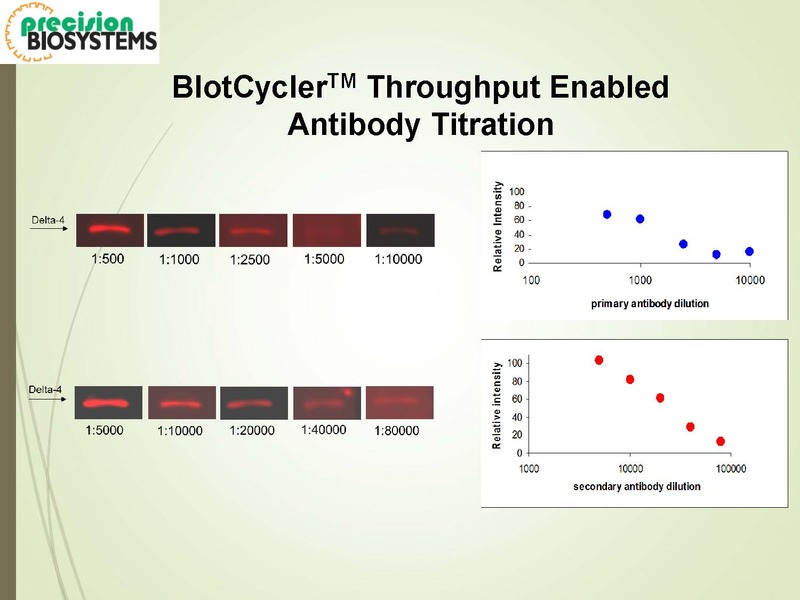 Finally, BlotCycler can save precious money on primary antibodies in two ways. 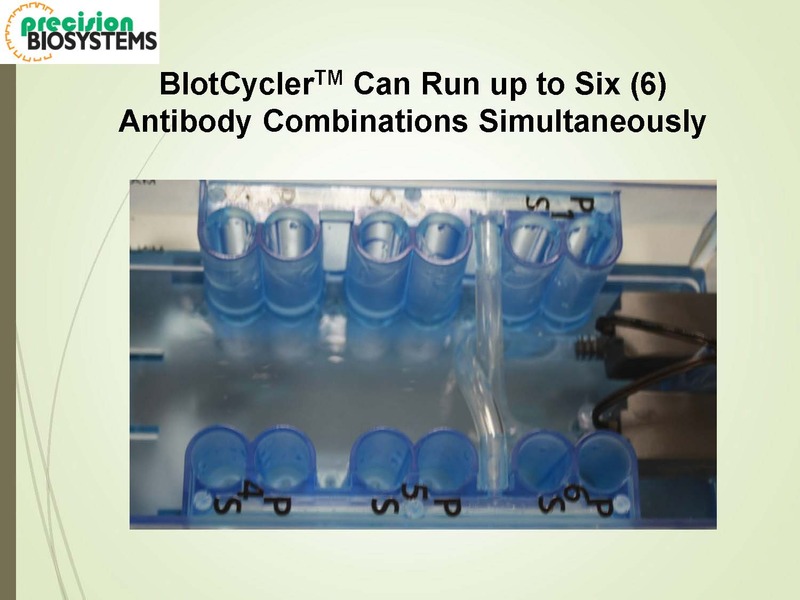 These are: 1) ability to recycle the antibody and 2) optimize the primary antibody concentration. 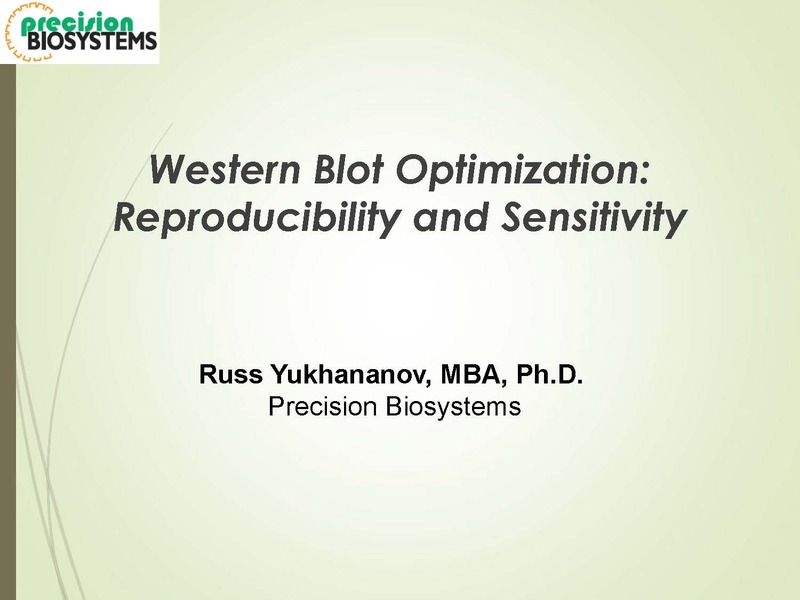 In western blot, inconsistent performance of manual Immunodetection methods has long been identified as the dominant source of variability results ! 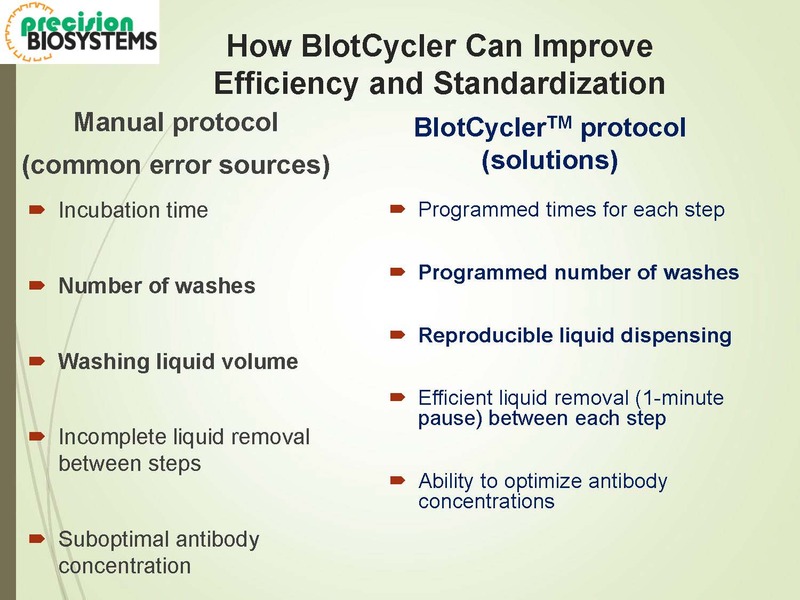 With BlotCycler™, you can automate protocols including the solution changes, blocking, incubation of primary and secondary antibodies, and washing steps precisely every time, obtaining consistent and accurate results over and over again, and increase productivity with rigorous precision delivering an affordable solution to busy labs that demands good reproducible results ! 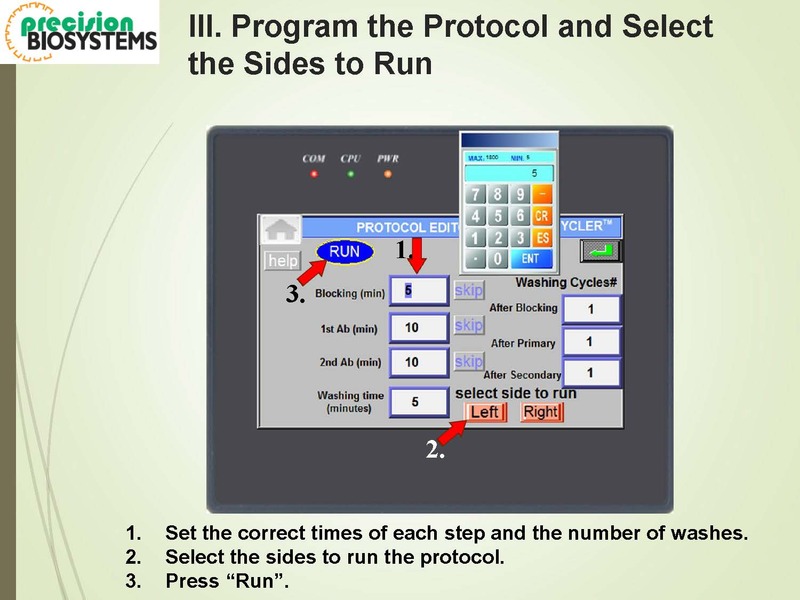 Ability to easily program all steps for individual protocols. It’s compact! It uses less than 12″ of lab bench. You can use it almost anywhere! It only requires an electrical outlet. It contains no vacuum, pressurized air or gas. And no additional pumps are required. 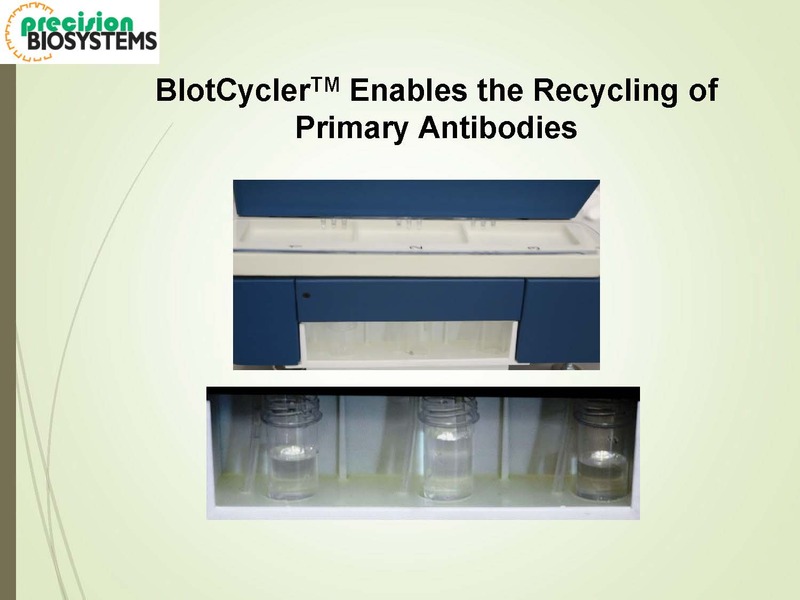 And, you can recover primary antibodies with ease at the end of the protocol. Built in the USA for years of trouble free use. 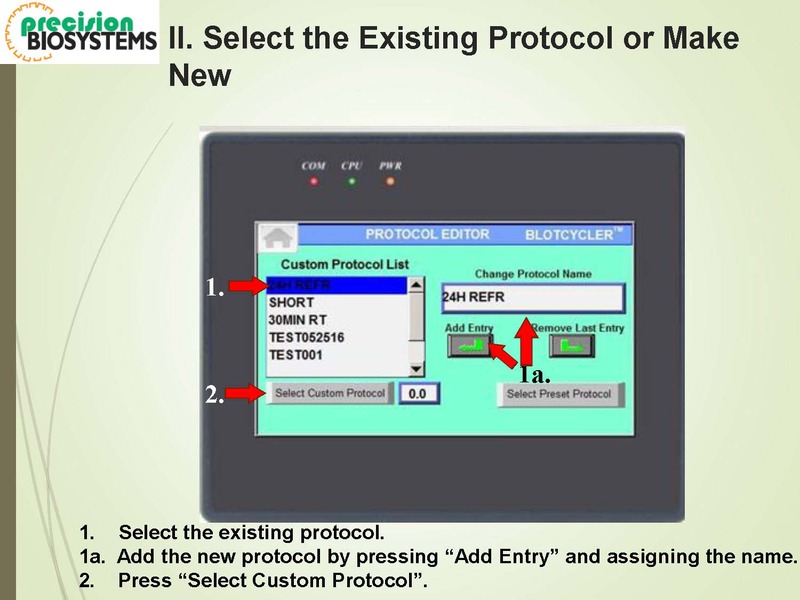 Program up to 100 protocol steps with an easy-to-use interface. 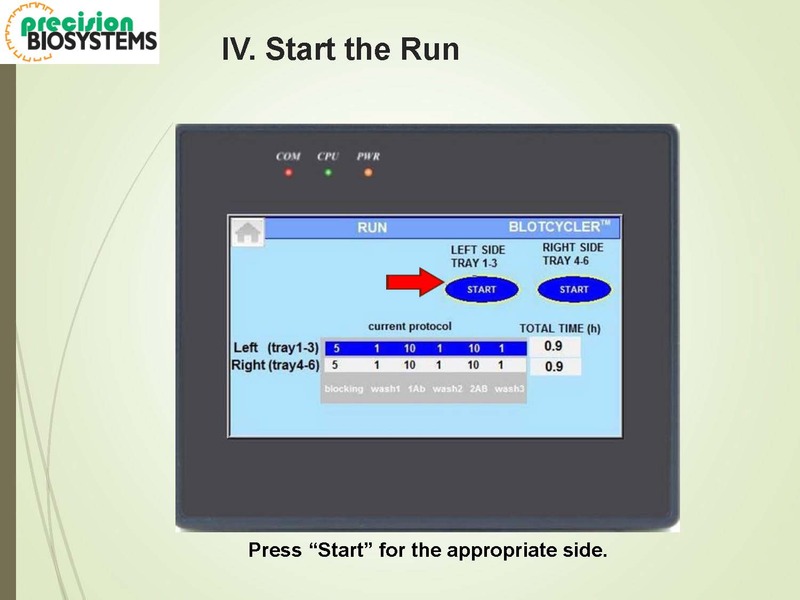 The parameters are adjustable for each protocol step. 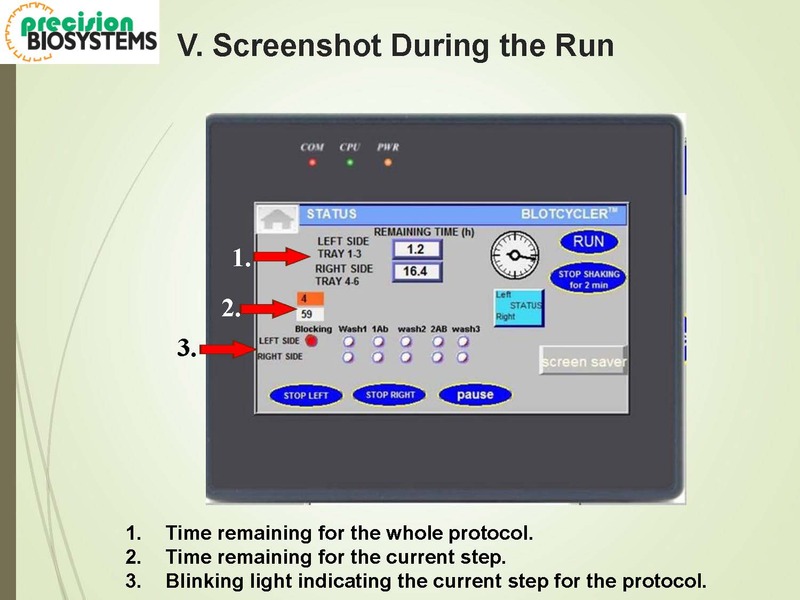 This includes incubation time from 5 minutes to 72 hours, and 1 to 12 blots per run. An audible alarm sounds at the end of the protocol. And then, the convenient cleaning cycle can be activated after each run. Wash buffer remains in the trays to keep the blots or gels wet. 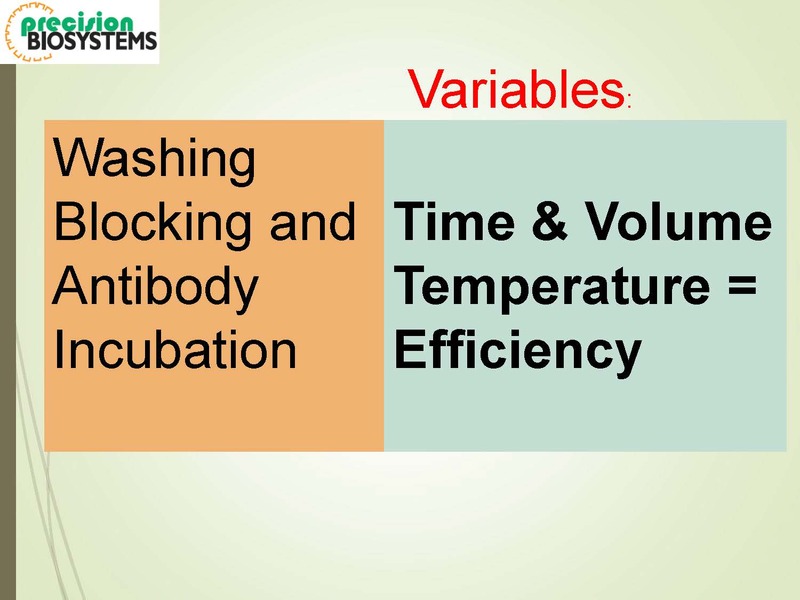 It is a common practice to perform the incubation with primary antibody at 4°C overnight and conduct the rest of the steps at room temperature during the manual procedure, as a convenience of not having to frequently go to the cold room for solution changes. 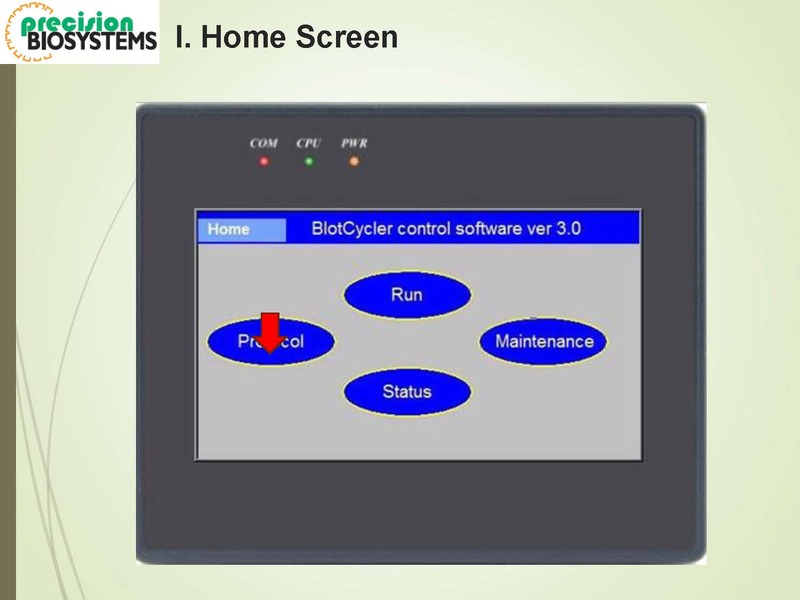 However this has been shown to eliminate advantages of incubation at low temperature on background and signal intensity. 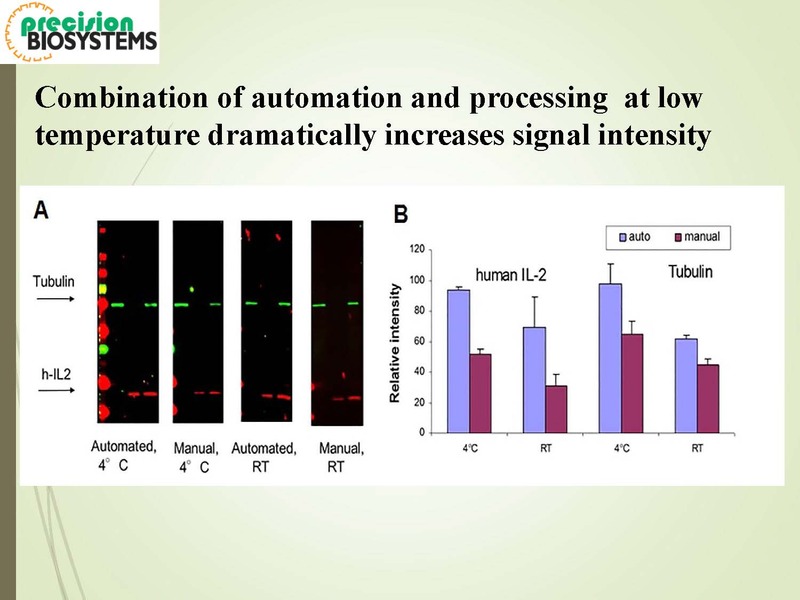 To further dissect the role of automation and incubation temperature in the increased signal, the manual and automatic processing were carried out entirely at 4°C or RT. 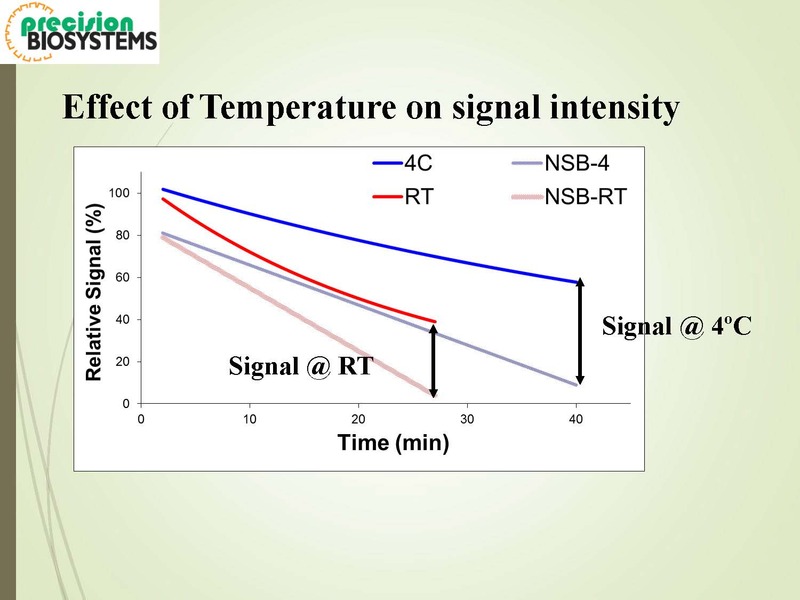 The results indicate that while both automation and 4°C alone increased the signal, the effect was most pronounced in combination of the two. 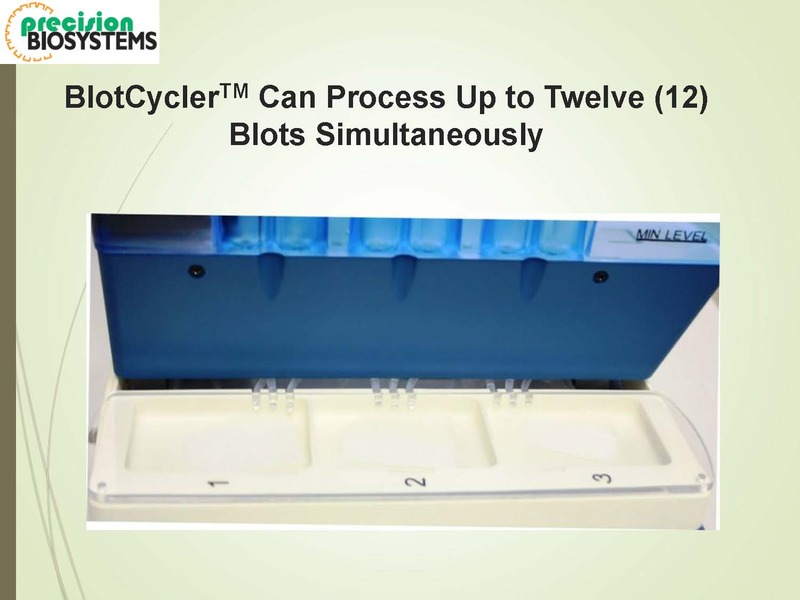 Therefore, BlotCycler™ offers the distinct advantage in improved sensitivity of western blotting procedure while eliminating the drudgery associated with the manual processing. 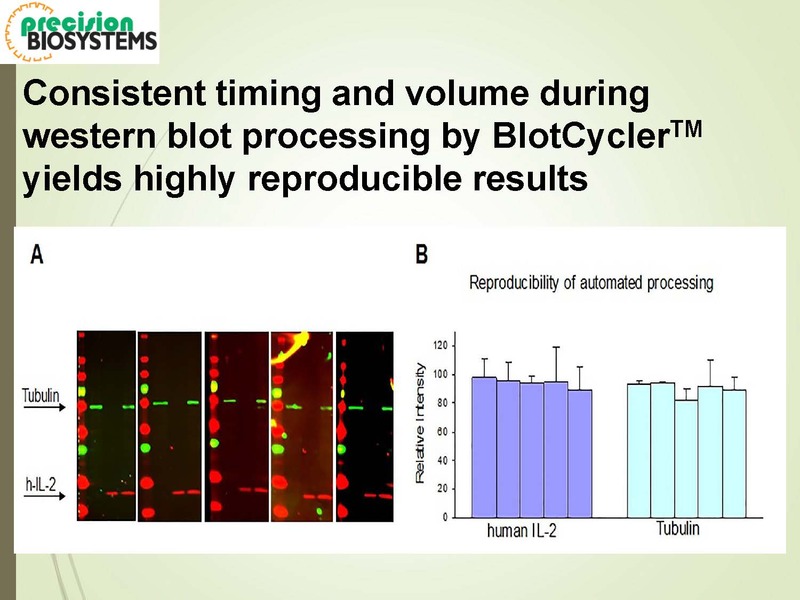 Excellent reproducibility results was demonstrated and confirmed quantitatively with the band intensity for each protein quantified and normalized against the marker, in direct consistent with visual observations, suggesting the salient characteristics, such as timing and consistency of solution changes, efficient washing, and elimination of operator caused errors, and enabling the much-needed standardization of Western blotting. Precision Stripping Buffer is optimized for efficiently and fast removal of primary and secondary antibodies but leave antigen attached to the membrane. 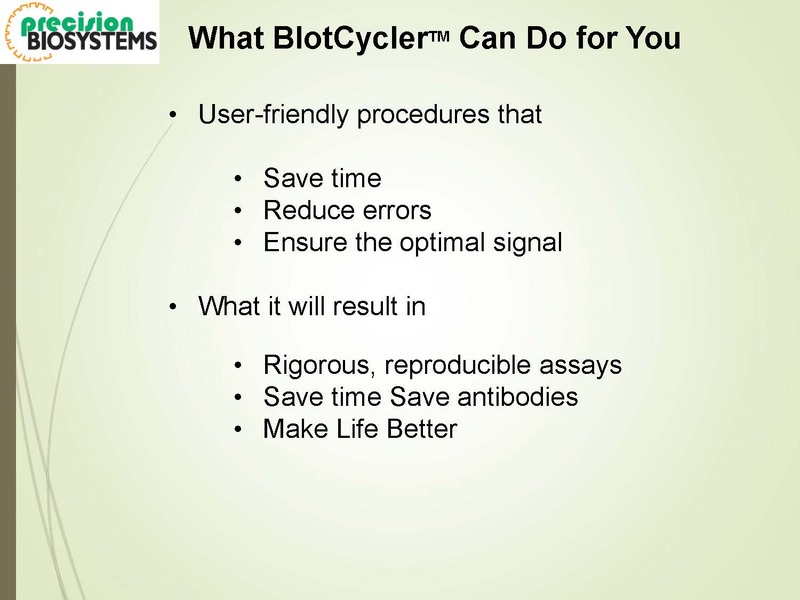 Stripping buffer can be used in manual procedure or for automated processing with BlotCycler. 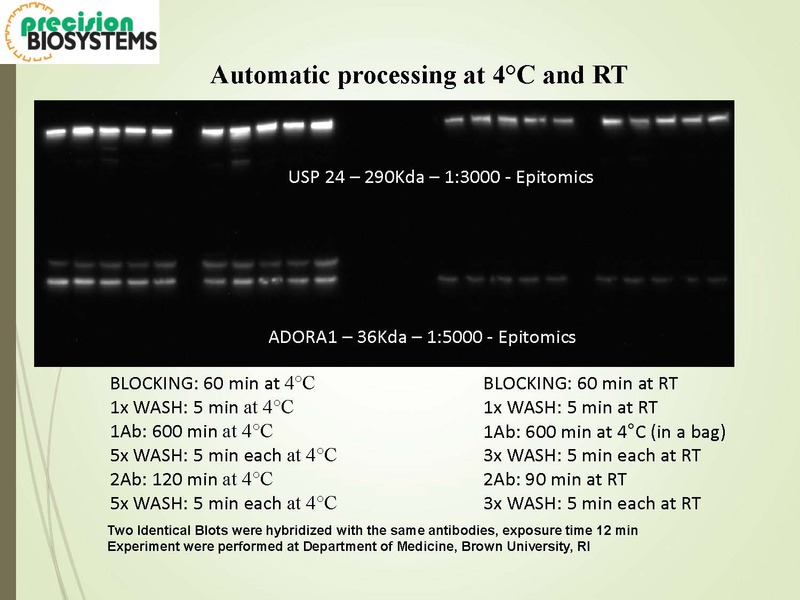 During automated processing stripping can be combined with new antibodies incubation. Membrane can be stripped and re probed up to 8 times without significant loss of sample proteins. 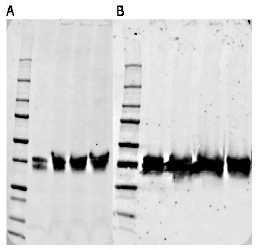 Membrane with brain lysate were incubated with synaptophysin antibody before (A) and after (B) stripping with Precision Stripping buffer (SB200). Experiment were performed at SRI International (CA). • Coated on both sides for improved consistency and overall performance.